The process optimized conveying geometry of the screws ensures continuous and gentle pressure build-up at highest constancy. In doing so only a low pre pressure of 0-2 bar is required. But with a system please. Extreme ease of maintenance and high availability characterize the Xtreamor. An easy screw change is realized in a short time. The low pre pressure relieves the upstream extruder, reduces wear and increases its lifetime. Energy! But not so much. Due to its twin screw design the Xtreamor consumes less energy than a single screw discharge extruder or a gear pump. The higher savings are caused by relieving of the main extruder which does not have to create a noteworthy pre pressure anymore. The conveyance ability of the special twin screw design guarantees lowest possible stress and strain of the material. 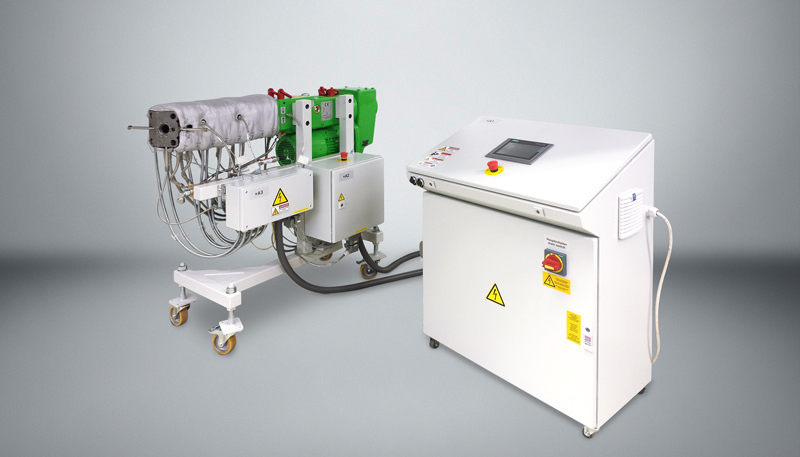 Together with the low pre pressure the output performance of the extruder can be increased significant. The continuous and careful pressure build-up leads finally to an improved product quality.